Their marriage was supposed to be a business transaction. Only love wasn’t factored into the contract. And he never expected he would fall in love with his husband. Tristan Castillo wants to make his marriage work, but there’s one problem— his husband. Not only is Tristan coming home, he’s bringing a surprise, a puppy named Apollo. But when he arrives home, he gets a surprise of his own. Grant adopted a dog too. And when he hears Grant named his puppy, Zeus, he figures it for a sign that they are meant to be together. Tech mogul and closet jazz musician, Grant Thornton needed a husband to get past the codicil in his grandfather’s will. It was supposed to be a simple business transaction. 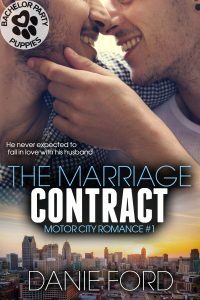 Only love wasn’t part of the bargain and Grant doesn’t know if he loves Tristan or the things he does to his body. As a former Marine and Michigan State Trooper turned chocolatier, Tristan is used to going after and fighting for what he wants. Sure, love wasn’t in the contract but it’s not something you can put a value on either. He came back to win his husband and he’s going to pull out all the stops to get Grant to open up to the possibility of love and a happily ever after with him. With the help of Zeus and Apollo, Tristan and Grant start their journey towards forever. But old demons and old habits threaten to keep this union a true marriage of convenience.